Velké Meziříčí is situated on highway D1 between Prague and Brno, 141 kilometers from Prague. 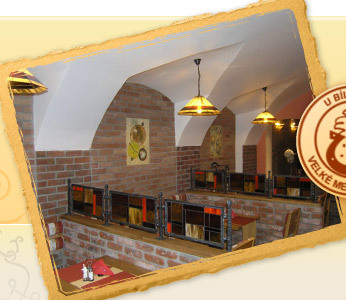 The Hotel is situated in downtown Velké Meziříčí, only two minutes' walk from the square, close to the crossroads to Třebíč. We offer a large car-park and there is also a smaller car-park directly in front of the restaurant. See the MAP of VELKÉ MEZIŘÍČÍ.